Headers, footers and page numbers can be added during the printing process. 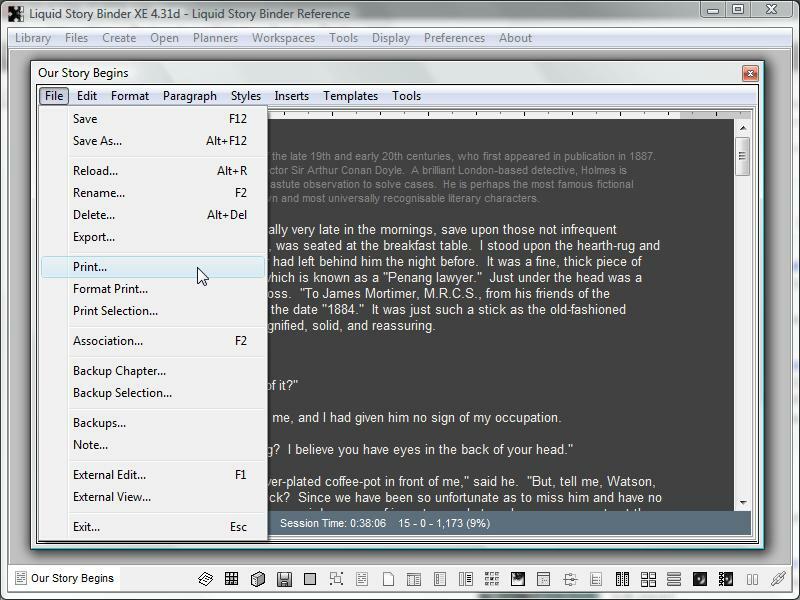 To add page numbers to a Chapter, begin by opening the Print Preview dialog. 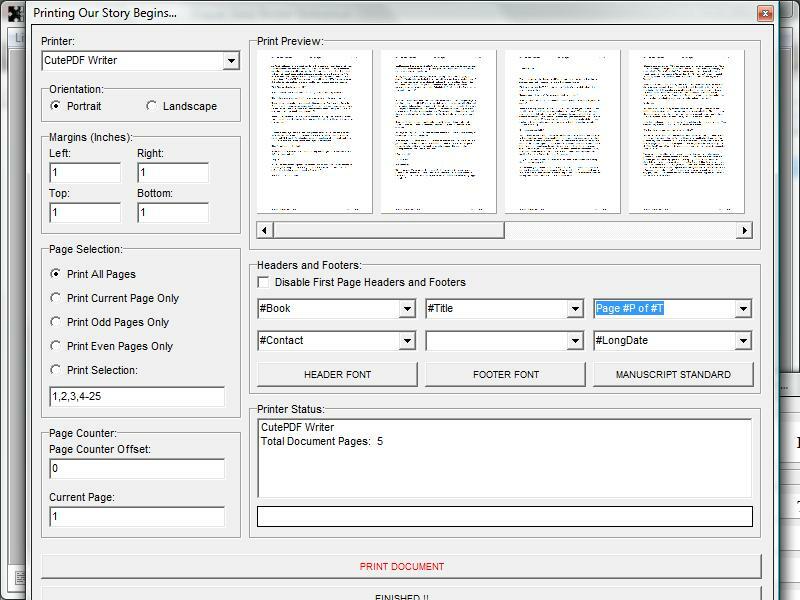 Choose 'Print' from the Chapter's 'File' menu. Use the 'Headers and Footers' box to change your settings. When printing, you have six header and footer placement choices. Headers are shown at the top of the page, while, footers, inversely, are displayed near the bottom. Headers and footers are centered vertically within their associated margin. 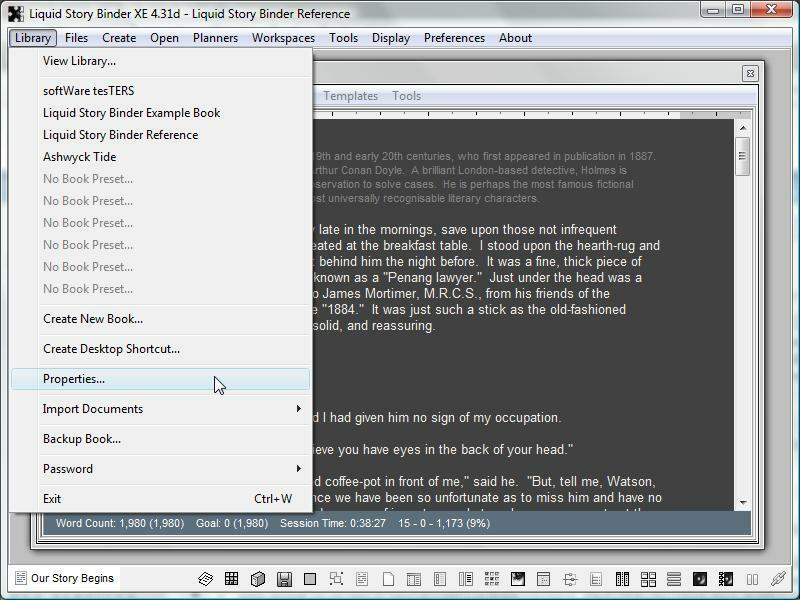 Use the header / footer drop down boxes to choose from a convenient list of options. To display the current page number, use the #P symbol. You may locate this symbol anywhere within your header/footer text. To display the document's page total, use the #T symbol. For example, 'This is Page #P of #T'. By clicking one of the two font buttons ('Header Font' and 'Footer Font'), you can change the font style for both headers and footers. 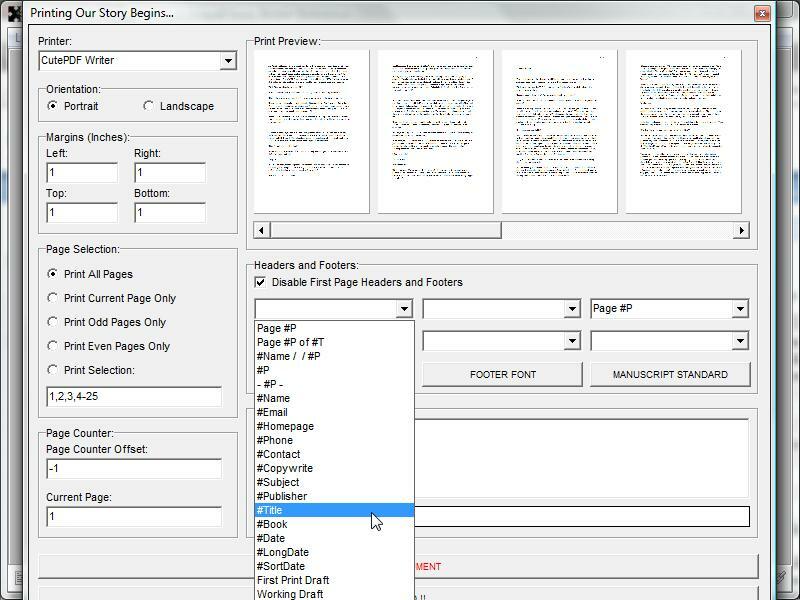 Click the 'Disable First Page Headers and Footers' when printing a title page. Set the 'Page Counter Offset' to -1. 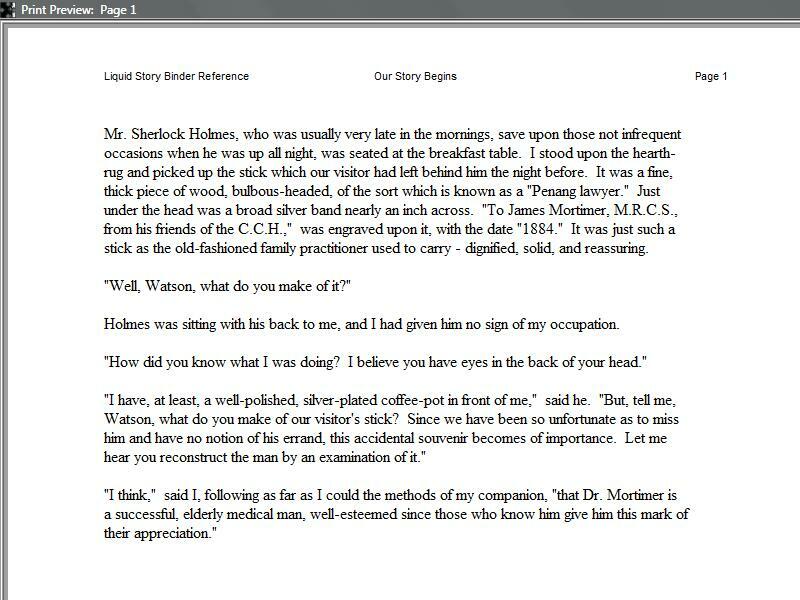 This sets the page count back one position -- page 1 becomes page 0, page 2 becomes page 1. 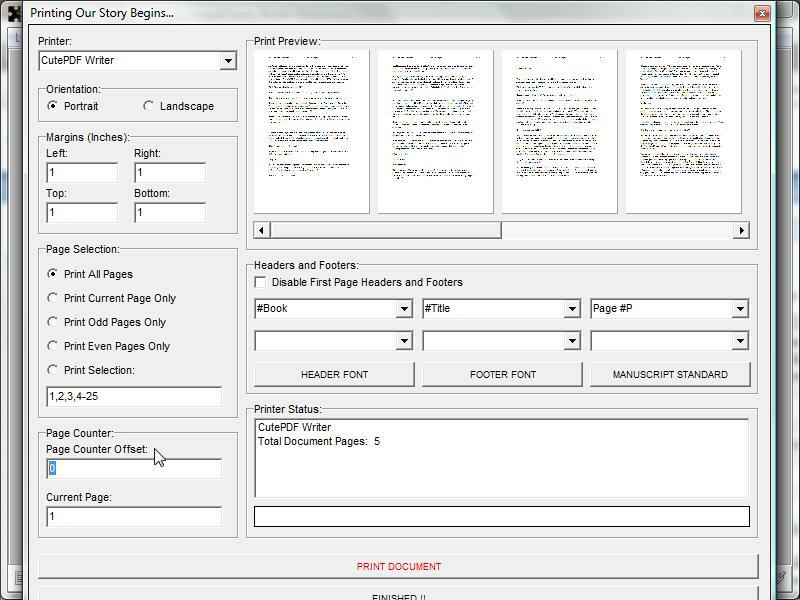 Use the 'Page Counter Offset' when adding Chapters together to form a manuscript, setting the offset to the last page number of your currently printed manuscript. Selected headers, including page number, shown in the print preview. 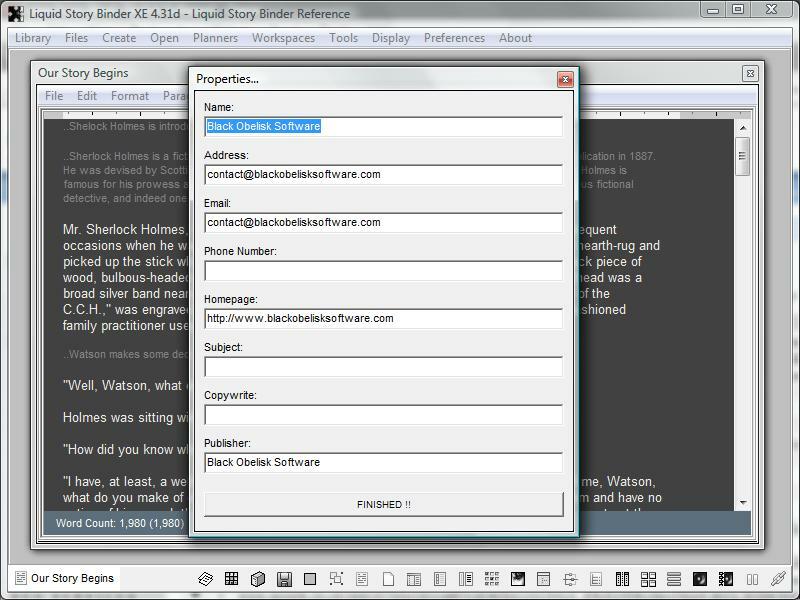 Use the 'Properties' dialog to enter book and contact information for your headers and footers. Choose 'Properties' from the main 'Library' menu. The 'Properties' dialog contains fields used in printing. Here you can set content for the #Name, #Address, #Phone, #Homepage and #Publisher printing header / footer options.